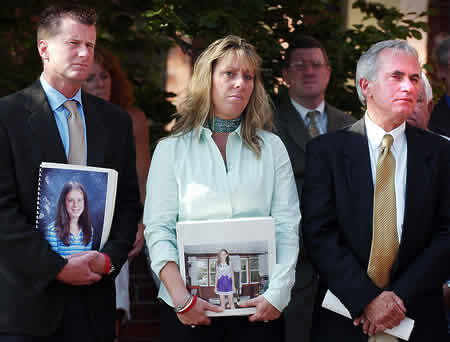 Melanie Powell’s family, from left, her parents Tod and Nancy Powell, and her grandfather Ron Bersani, appear outside Quincy District Court, where they joined in a rally to urge the Legislature to pass Melanie’s bill, a law that would increase penalties for repeat drunken drivers. Advocates of a sweeping bill that would crack down on repeat drunken-driving offenders say the version debated by lawmakers today is so watered down it doesn’t deserve to be named for Melanie Powell, a 13-year-old victim from Marshfield. An increase in the length of license suspensions from 180 days to one year for people who refuse to take a field sobriety or Breathalyzer test, and harsher penalties for subsequent refusals. Required in-car breath analyzers for repeat drunken drivers. The devices must be blown into in order to start the vehicle. The ability of prosecutors to use certified court records as proof of previous drunken driving convictions, instead of requiring officers from previous cases to appear in court again. The creation of three criminal charges: driving under the influence with a child under 17 in the car; aggravated drunken driving, which would apply to anyone with a blood alcohol content of 0.20 or higher, 0.08 is the legal limit; and manslaughter by motor vehicle. State Rep. Frank Hynes, D-Marshfield, planned to offer amendments today to restore some of the original provisions. “My initial reaction (to the new version) is one of disappointment because I don’t think it represents the true intent of Melanie’s bill, which was to give to the general citizenry a more positive sense of security and safety when they’re on the roadways,” Hynes said. The Senate is scheduled to take up the bill tomorrow, and at least some members have said they, too, plan to file amendments that would restore stricken parts of the bill. If the two chambers approve different versions, they would be sent to a conference committee to reconcile the differences. Lawmakers are rushing to pass some version this week because Massachusetts faces a Saturday deadline to meet stricter federal standards or lose $9 million in transportation funds. Lt. Gov. Kerry Healey said the new draft still falls short of the federal requirement, in part because it doesn’t require that repeat drunken drivers’ cars be equipped with the onboard breath tests, or ignition locking devices. She said Romney would be unlikely to sign the House bill if it passes in its current form. A call to the Judiciary Committee office was not returned, and Garrett Bradley, a Hingham Democrat who is vice chairman of the committee, could not be reached last night. Rep. Daniel Webster, R-Hanson, another member of the judiciary committee, said he was not involved in the redrafting and had not seen the new version. The revisions were not unexpected. Judiciary committee co-chairman Rep. Eugene O’Flaherty, D-Chelsea, had recently questioned whether some provisions of the law would stand up in court, including the harsher penalties for refusing a field sobriety test. His co-chairman, Sen. Robert Creedon, D-Brockon, also has been critical of some of the harsher measures. But in a letter last week to O’Flaherty and Creedon, Plymouth County District Attorney Timothy Cruz said he believed the original bill would not only pass muster, but was appropriate. Ed Melia of Quincy, whose pregnant granddaughter lost her baby after her car was struck by a repeat drunken driver, hopes lawmakers agree. He views Melanie’s bill as an opportunity to prevent other families from enduring what his did. “I just hope this a joke, what the redraft is, because it can’t be anything else,” he said. Karen Eschbacher may be reached at keschbacher@ledger.com.